We live in a world that is constantly changing. Developing. Evolving. As proof take Longines. This brand started in Switzerland back in 1832 as the much smaller outfit, Raiguel Jeune & Cie. The company name and scope of operation was different then, but through the years it has stayed true to its aim to deliver high-quality watches that are both luxurious and accurate. Over 150 years later, premier watch manufacturer The Swatch Group took notice of the brand's durability and acquired it. With all of these great developments, the brand's logo serves as a reminder of much humbler beginnings. Registered in 1889, it is the oldest unchanged and still active registered trademark. 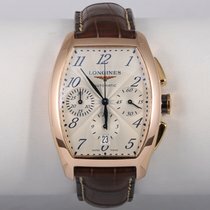 By owning this Longines Evidenza you become a part of the great progress and legacy that is Longines. Like Longines, you too will continue to soar to greater and greater heights. We NEVER cut and paste. 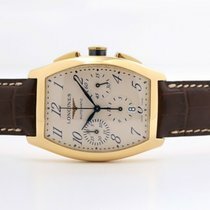 All pictures are of the actual watch in our inventory.